The Lower Manhattan Security Coordination Center on Broadway, built with more than $150 million of taxpayers’ dollars, is spy-central for keeping tabs on the Occupy Wall Street protesters. Sharing the space with the Wall Street crowd in spy-central are at least four formal police groups: the New York City Police Department, the Transit Police, the Port Authority Police, and the newly exposed, privately employed, Federal Reserve Police Department. There are also security representatives from Brookfield Properties, the real estate firm that has been at war with the protesters in Zuccotti Park, the birthplace of the Occupy Wall Street movement. 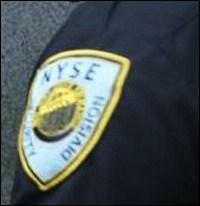 And as the photo above indicates, even the New York Stock Exchange now has its own men in blue. Given the police-state nature of today’s Wall Street, it’s easy to forget that Wall Street started out as a few men trading shares of stock on the curb in lower Manhattan. It’s even easier to neglect to question why the central function of Wall Street, providing a medium for trading stocks and bonds, should require a mushrooming police state. And, virtually no one in corporate media questions why the police are guarding the serial wrongdoers and arresting those courageous enough to protest the systemic corruption. The police state image of Wall Street is the antithesis of positive brand marketing. The millions of young people around the globe who have either directly protested against Wall Street or watched the protests on live video streams have formed an indelible vision of a corrupt system being propped up by an equally corrupt system of state enforcers. This growing divide between the next generation of investors and the institutions that need those investment dollars to survive could be heard in the chants of Occupy protesters marching in lower Manhattan this past Monday, September 17, marking the one year anniversary of the Occupy Wall Street movement. There is the overarching feeling that Mayor Michael Bloomberg, a billionaire whose business empire derives billions in income from Wall Street, and Police Commissioner Raymond Kelly, who likely desires to take up residence in Gracie Mansion, are enablers to Wall Street’s every whim. There are no politician voices asking the crucial question for the country, and for the essential business function of trading stocks and bonds in America: where will the next generation of customers come from?